Mayor de Blasio, NYCEDC and Speaker Mark-Viverito Announce Grand Opening of New Health Center in South Bronx. Special thanks to: NYC Mayors Office. 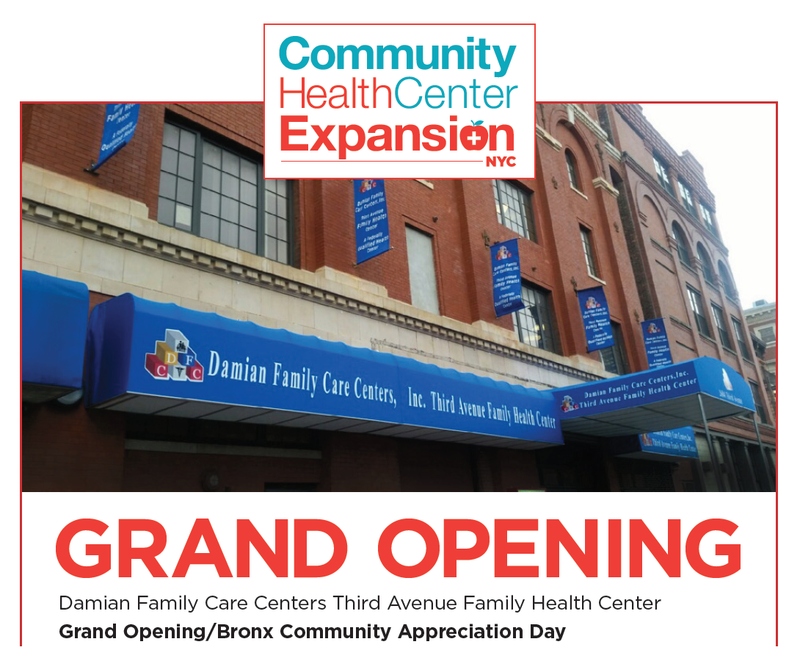 "The Damian Center's Third Avenue Family Health Center will provide much needed access to healthcare for residents of the South Bronx," said Council Speaker Melissa Mark-Viverito. "As a proud representative of the South Bronx in the City Council, I'm happy to work with the de Blasio administration and the Economic Development Corporation to bring healthcare access to as many as 100,000 new patients in this community." The Third Avenue Family Health Center opens as part of the Caring Neighborhoods initiative, a vital part of the administration’s commitment to reduce health disparities through building primary care capacity in neighborhoods where New Yorkers have faced limited options for convenient and affordable health care services. In total, over 100,000 new patients will be able to receive care in their own neighborhoods thanks to the community health centers expanded through Caring Neighborhoods. The City committed $20 million over two years in its Fiscal Year 2016 budget to cover pre-development and start-up operating costs for new health centers. 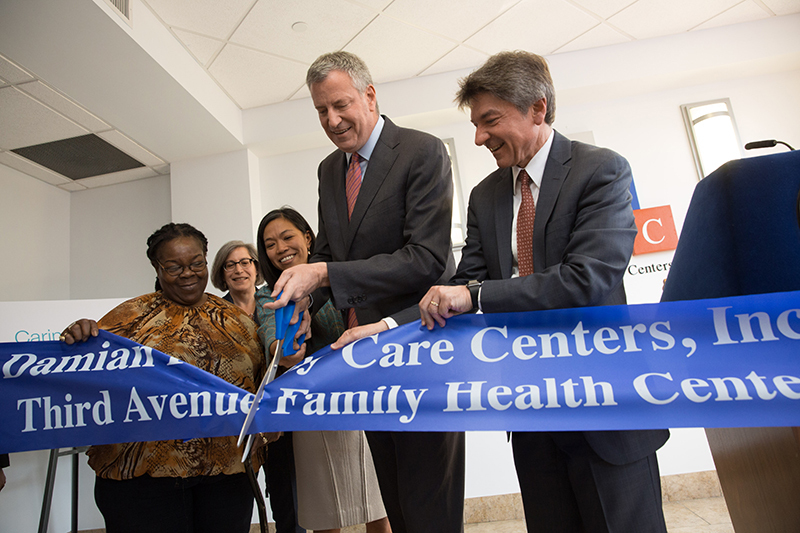 The Third Avenue Family Care Center opening is a result of concerted efforts to build stronger neighborhoods and address longstanding health disparities. Because of the administration’s efforts, the Damian Family Care Center is able to take over a previous for-profit medical facility while doubling the average number of patient visits per year and ensuring primary care is available to all regardless of ability to pay. The Third Avenue Family Health Center will provide comprehensive care at this site including primary, dental, child and adult behavioral health care, specialty services and an on-site pharmacy. The health center is located several blocks away from two schools and three New York City Housing Authority (NYCHA) public housing developments, ensuring patient accessibility. The site is expected to treat over 10,000 patients annually when at full capacity. The Damian team, led by President and CEO Peter Grisafi, is committed to improving the compensation, benefits and job quality for their staff at the Third Avenue Family Health Center, which consists of 90 percent Bronx residents. Through the support from NYCEDC’s Community Health Center Expansion Program, Damian was able to preserve 60 jobs during the site takeover, and continues to create new staff positions. As part of Caring Neighborhood’s strategic approach to expanding primary care, NYCEDC’s Community Health Center Expansion Program provides a range of support to Federally Qualified Health Centers (FQHCs) and FQHC look-alikes. There are over 30 non-profit health centers that already provide high-quality primary care in New York City and seek to expand their services in high-needs neighborhoods. The program seeks to accelerate the creation of these health centers by making available on a competitive basis up to $8 million in grants, real estate assistance to help identify new health center sites in underserved neighborhoods including potentially City-affiliated properties, and one-on-one technical assistance, among other benefits. This effort is the latest in NYCEDC’s portfolio of programs to generate shared prosperity for all New Yorkers. As the City’s primary engine for economic growth, NYCEDC is committed to strengthening neighborhoods and growing quality jobs by building community assets and ensuring that those community assets – like community health centers – have the resources to scale up. NYCEDC’s Healthcare Desk leads healthcare enterprises to more equitable and profitable business models for both workers and employers through programs addressing health technology adoption, payment reform, real estate transformation, and health inequities. The Caring Neighborhoods initiative complements the Department of Health and Mental Hygiene’s (DOHMH) initiative to support the integration of public health and primary care in high-need neighborhoods by revitalizing its underutilized buildings to co-locate community-based organizations and providers of medical, dental and mental health services. It also complements the administration’s work to improve healthcare access for immigrant New Yorkers, as recently detailed in a report by the Mayor’s Task Force on Immigrant Health Care Access. As noted in the report, FQHCs are critical healthcare safety-net providers, delivering culturally competent primary care in community-based settings in neighborhoods with high concentrations of immigrant New Yorkers. The healthcare sector is the leading employer in New York City, providing approximately 515,500 jobs, approximately 18,500 of which were created over the last year. In 2015, the federal government awarded $8.6 million in New Access Point annual operating grant funding for FQHCs in New York City; the de Blasio administration provided letters of support for many of these applicants. “The new Damian Family Care Center will help expand access to quality health care to thousands of individuals in the South Bronx. Healthcare disparity is one of the great injustices that continue to afflict underserved communities throughout the nation. Thanks to this initiative more families will have access to the care they need regardless of their ability to pay," said Congressman José E. Serrano. "Many thanks to Mayor de Blasio, the New York City Economic Development Corporation and the Damian Family Care Center for opening this new state of the art facility in the South Bronx. This community health center will have the ability to serve up to 10,000 new patients regardless of their ability to pay. This center will be an incredible tool in combating the health disparities that have plagued the South Bronx for far too long," said State Senator José Serrano. "In the Bronx, we're committed to not being 62 out of 62 when it comes to healthiest counties in New York State," said Council Member Rafael Salamanca. "That's why I'm thrilled to see a new health center open for South Bronx families to help greatly expand healthcare access, and undoubtedly help move us away from being 62."